Although at least 8 species of frogs were imported into New Zealand in the mid- to late 1800s, only three of these species established populations that still exist today. These all belong to the family of Hylid tree frogs. They are fairly easy to distinguish from the New Zealand native species as they all produce characteristic calls, unlike the mainly silent native frogs. Click here to hear Helen Sharpe's "Frogcast" about how to identify the three species of introduced frogs. The Green and Golden Bell Frog, Litoria aurea, is a magnificent looking frog and can often be mistaken for a garden ornament! In the late 1860s several consignments of these frogs were received from Sydney and released by the Auckland Acclimatisation Society. There have been several attempts to establish populations of this species in the South Island, but it appears that the climatic conditions are not favourable and the species is restricted to the upper half of the North Island (north of Gisborne). They occur around the same ponds as the Southern Bell Frog and may interbreed. Description ~ these frogs are brilliantly coloured with an overall green appearance interspersed with gold or bronze coloured patches. There is a fold of skin (usually cream in colour) running from the eye along the side of the animal to its groin. This fold is bordered by a thin black line that continues over the head to the nostrils. The back of their thighs and groin area are bright blue and the belly is smooth and white. The skin is very smooth and there is only webbing on their hind feet. They have suckers for climbing on all toes and fingers. Males are smaller than the females with an average length of about 60 mm, whereas females can be larger than 90 mm. Call ~ their deep nasal call has been described as a drawn out guttural four-part 'craaaaaaaaawk, craaawk, crok, crok, crok' and large choruses can sound like motorbikes from a distance. Breeding ~ these frogs are commonly found perched on aquatic vegetation or fallen trees near breeding sites. The frogs prefer temporary ponds in full sunlight that are usually shallow and free of aquatic predators such as Mosquito fish. They are quite unusual in the frog world in that they like to bask in the sun and are active during the day. They breed during the summertime with the males calling from the water’s surface. Females may lay between three and ten thousand eggs in a floating gelatinous mat, which sinks after 6-12 hours. The eggs hatch into black tadpoles after about two days, and metamorphosis occurs about two months later. The Southern Bell Frog, Litoria raniformis, is similar in colour and size to the Green and Golden Bell Frog, but has a lot more warts and less golden coloration. This species was introduced to New Zealand in the late 1860s from Tasmania by the Canterbury Acclimatisation Society. They have been very successful in New Zealand and can now be found throughout most of the country. Description ~ these frogs are the largest frogs to be found in New Zealand with females reaching over 100mm. They are similarly coloured to the Green and Golden Bell Frog but often have a warty back. They generally have more dark brown or black blotches on the back and there is always a pale green stripe down the middle of their back (although this can change in intensity depending upon environmental conditions). The back of their thighs and groin area are bright blue to turquoise and the belly looks granular. The fingers lack webbing while the toes are almost completely webbed. There are no suckers on the ends of their toes or fingers. Call ~ the call is similar to the Green and Golden Bell frog but is not as drawn out. It can be best described as crawcrocrocrocrok (in Australia it is also known as the Growling Grass Frog). Males usually call while floating in water. Breeding ~ the breeding details are very similar to the Green and Golden Bell frog except that this species seem to prefer permanent lakes, swamps and dams with still water. The Brown Tree Frog, Litoria ewingii (sometimes referred to as the whistling frog) was thought to have been introduced to New Zealand on only one occasion. Frogs and tadpoles of this species were caught in Tasmania and released in Greymouth (South Island) by W. Perkins in 1875. Although only one other documented translocation is reported for this species, from Greymouth to Manawatu, it has now become quite widespread over all of the South Island and most of the southern and central North Island, with the odd record in the northern areas. The wide distribution of this species is probably a result of human-mediated liberations rather then a natural spread of the frogs through self-seeding activities. Description ~ the brown tree frogs are generally an overall light brown colour, although this may very from a white/grey to a dark brown background. They all have a white stripe along the jawline from the armpit, to at least, below the eye and sometimes to the end of the snout. Most frogs have a lighter patch on the top of the head, extending from between the eyes to the tip of the snout. The belly and throat are usually white or cream and the undersides of the thighs are bright orange. The eardrum (tympanum) is quite distinct and easily visible and this characteristic alone separates this species from our native Leiopelma species. The fingers and toes have slightly expanded tips (suckers) that are used for climbing, and webbing is usually absent. These are generally quite small frogs ranging from about 30-50 mm long (nose to rear measurement). “weeeeep-eeep-eeep-eeep-eeep-eeep”. Although in several books this species is referred to as the whistling tree frog, the common name brown tree frog is preferable as the call doesn’t sound anything like a whistle! Breeding ~ these frogs are quite unusual as they can breed throughout the year in favourable conditions. During rainy spells males can be heard calling (even in mid-winter) and tadpoles can be found in most months of the year, even when there is frost around. 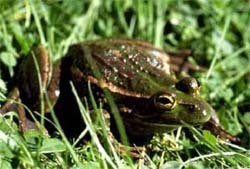 (Current research at the University of Otago is investigating how these frogs cope with the bitterly cold weather in Central Otago). The males usually call from concealed positions within vegetation around ponds and streams. These frogs have external fertilisation and clumps of eggs are laid underwater sticking to submerged plants. The tadpoles are black when they first hatch and gradually turn brown as they get older. The tadpoles are quite difficult to tell apart from those of other introduced species. These species were introduced to New Zealand but did not establish populations here. It is presumed that these animals died out, as they are no longer present. Common frog (Rana temporaria) introduced from England to Canterbury in the 1860s, but failed to establish. Edible frog (Rana esculenta), similar in appearance to the common frog, introduced from Europe to the Nelson area in 1860s and also failed to establish. The common toad (Bufo bufo) was a likely choice as it enjoys the British climate. It was introduced in the late 1860s and again in the 1890s, however they failed to establish both times. 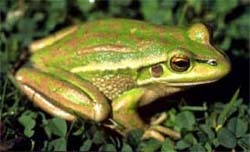 White's Tree Frog (Litoria caerulea) was introduced from Australia to New Zealand in 1897 and 1899 and liberated at several sites around the country, followed by an accidental import in the 1940s. However, there have been no sightings since the 1950s, and it is assumed that the species did not establish. One individual of the Dainty green tree frog (Litoria gracilenta) arrived in New Zealand on rigging of a ship from Australia in 1972 and has not been seen since. Several Slender tree frogs (Litoria adelaidensis) were reported in New Plymouth in 1981, however no evidence of an established population has been found.